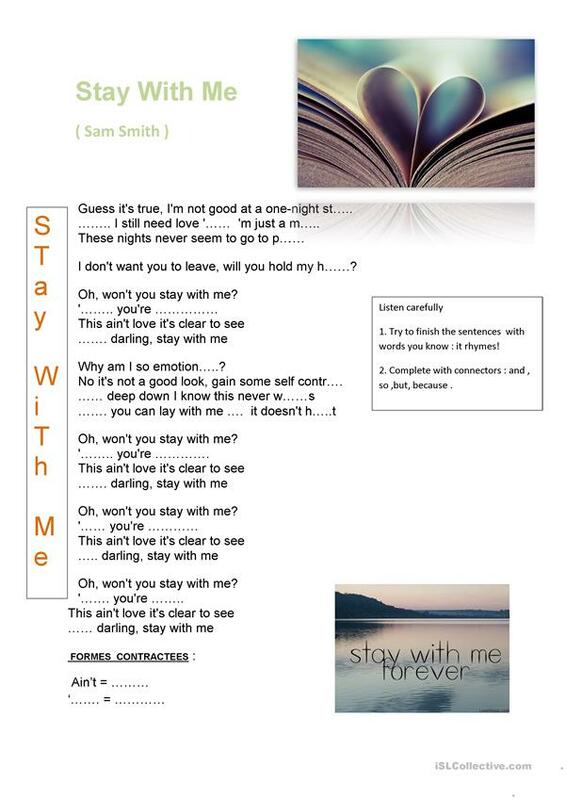 The purpose of this song is to improve the pupils' listening .They have to complete the endings of some words end to find the linking words missing. it's easy to sing , quite new and modern. This printable, downloadable handout is best suited for high school students at Intermediate (B1) level. It is aimed at practising Phonetics (pronunciation, IPA, phonetic symbols) in English, and was designed for enhancing your pupils' Listening skills. It is about the vocabulary topic of Valentine's Day. sigourney is from/lives in France and has been a member of iSLCollective since 2013-09-15 21:11:18. sigourney last logged in on 2019-04-09 11:29:10, and has shared 9 resources on iSLCollective so far.